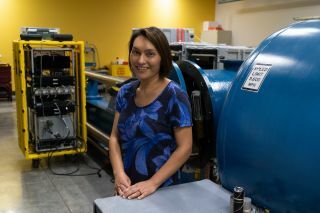 Sarah Stewart, a planetary scientist at the University of California, Davis, uses instruments that can create powerful shock waves to study how planets form. It's not every day you meet a bona fide genius — much less become one. But that's exactly what happened to Sarah Stewart, a planetary scientist at the University of California, Davis, when she became one of the MacArthur Foundation's 25 fellows for 2018, winning five years' of funding totaling $625,000 to be used however she chooses. The fellowship has notoriously been dubbed the "genius grant," although the foundation itself does not use the term. Stewart's award recognizes her wide-ranging research as a planetary scientist, which she said was inspired by reading science fiction novels and watching "Star Trek" with her father. In college, she majored in astrophysics and decided to focus on planet formation. But rather than pick a particular problem to tackle, she ended up falling for a technique — shock- compression experiments, which use a large air cannon to mimic conditions during giant collisions in space. "I'm one of these scientists that wanders around the solar system," Stewart said. "Nobody grows up thinking they're going to run cannons for a living, so this is a bit of a fluke, right?" Stewart has access to two guns, which measure 40 mm and 25 mm, at her own institution, and she's worked out ways to access even higher-powered facilities at Lawrence Livermore and Sandia National Laboratories (Both facilities are run by the U.S. Department of Energy.) These machines are powerful enough to expose mineral samples to incredibly violent pressures — conditions as extreme as those at the heart of Jupiter — long enough for scientists to measure what's happening inside. Shock-compression experiments act as a sort of time machine, carrying Stewart and her colleagues back to watch these early solar system events right from the comfort of the lab. Her best-known research focuses on what happened during the formation of our moon. The experiments are only a little less stressful than that initial impact might have been, she said. "Firing of the gun is high drama," Stewart said. "It's a lot of planning and preparation for a blink of terror." But when that blink goes smoothly, the experiments can produce some deeply intriguing data — like the results that led Stewart and her colleagues to overhaul scientists' leading idea about how the moon formed. "Everything that everyone assumes about this stage is wrong," Stewart said she and her then-graduate student Simon Lock realized as they looked at those initial experiment results. Stewart's collision results point to an explanation that neatly avoids that problem: the giant impact didn't cause the moon to break off. Instead, it caused both objects to vaporize and swirl into a fleeting but giant donut-shaped phenomenon the team dubbed a synestia. Earth and the moon each settled out of this theorized-but-never-seen body, identical compositions intact. "What we realized was that the Earth didn't really look like a planet anymore," Stewart said. "When we first saw this and realized that it changed how the moon would form, we called it the disk that wouldn't fall down." It took four years for the research team to craft the findings into a paper they felt comfortable publishing. Scientists are still hashing out the play-by-play that ended up with Earth and the moon, and Stewart doesn't intend to abandon that conversation despite her recent windfall. "I love my day job, I'm not going to quit my day job," Stewart said. In addition to cracking the secrets of the moon, she also has other questions she wants to tackle, like studying parts of Earth's mantle that may be unchanged from before the giant impact. She compared the process to making a marble cake, leaving swirls of the original recipe that can still be studied. But she said that the fellowship award will give her more flexibility to be creative, within her research and beyond. "The promise is just to make it new and exciting and that's it," Stewart said. "That's the one string I'm putting on it."